I’m struggling to stay motivated. Two week ago I did a mad, long run of 15 miles, in three stages, to break through my sense of dullness. It probably did more harm than good as I was in moderate pain for a few days after. This morning I went out before 6:00 am and ran just over a mile in just over 12 minutes. It was cold and wet and raining a little. My ankles and knees ached a bit while I was running so I kept it short. The challenge was not the run but getting up and getting out in the first place. A cold shower and a short japa meditation completed my morning sadhana. A journey of a thousand miles starts with a single step. One of my personal challenges this year is to run a thousand miles and to spend a thousand hours on my sadhana or spiritual practice, which includes running, meditation and yoga. I have barely started. Just been going through my papers and found this chart. 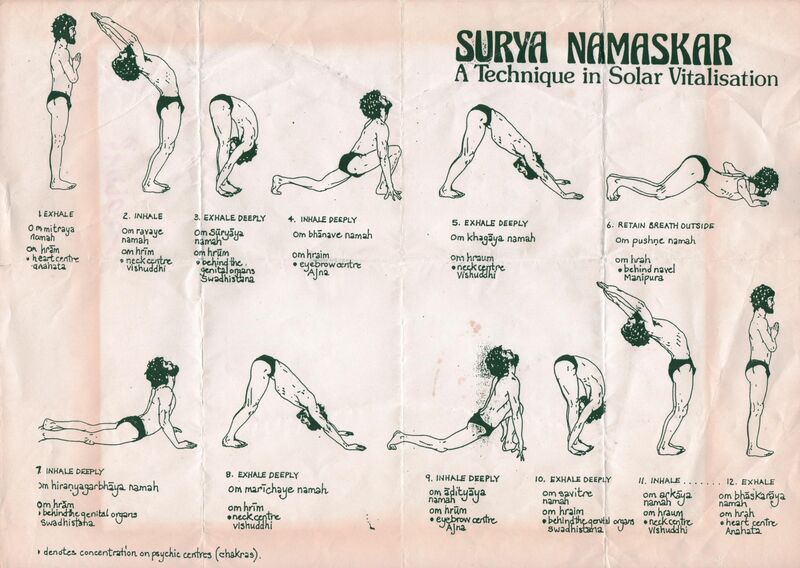 Surya Namaskar is a basic dynamic yoga exercise.